Bored of drab same old life here in Korea? Then, take a break with Korea's most popular percussion group, Nanta: Cooking Percussion Group meaning "wild beating." 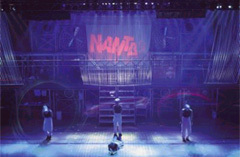 You can excite yourself with Nanta's music and beats which include comedy actions and glipse of Korean culture. Nanta's energetic percussionists dressed in chef's attire dance with knives as cucumbers, cabbages and onions flying in the air. Nanta's rythym is basically composed of loud Korean percussion rhythm called Samulnori music. Samulnori music, with four percussion instruments, was loved hundreds of years in the past by Korean farmers who played the music in the field in their efforts to relieve themselves of laborious farm work. Nanta music mixes the Samulnori music with a touch of rock and jazz. But the best part of Nanta would be its ability to interact with the audiences who normally find themselves stomping their feet or bobbing your head to the tune of its lively rhythms, making themselves totally refreshed and revitalized at the end of the performance. Nanta music has reaped international acclamations for their mesmerizing performances. Nanta made a huge success at international events such as the Edinburgh Fringe Festival in England and the Disney World in Florida, US. Nanta plans for further global tours that include Taiwan, London, Vienna, New York, and Hong Kong. Four teams take turns for their long-running Nanta play/musical at their permanent theater. For further details, please log onto: http://nanta.co.kr, or call 02-739-8288.